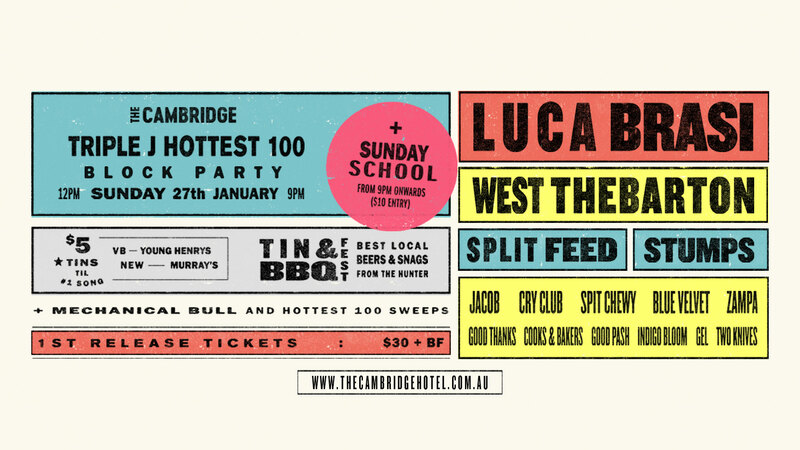 A triple j Hottest 100 Block Party ft. Luca Brasi, West Thebarton, Split Feed, Stumps, Jacob, Cry Club, Spit Chewy, Blue Velvet, Zampa, Good Thanks, Cooks & Bakers, Good Pash, Indigo Bloom, Gel and Two Knives. The Hottest 100 from 12pm in The Car Park. Tin & BBQ Fest w/ local snag and veg options. Mechanical bull and Hottest 100 sweeps. $5 tins until the #1 song finishes. Luca Brasi start after the #1 song has been announced. First release tickets start at $30 + bf.